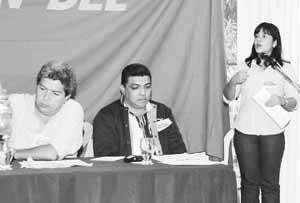 Mildre Daza (right), a miner at the Crystallex mine in the state of Bolívar, Venezuela, speaks at the First National Conference toward Building the Workers Party of Venezuela held September 27 in Puerto Ordaz. Daza described the strike the iron ore miners launched June 2 for better wages and against unsafe working conditions. Next weeks Militant coverage will include a firsthand report on the conference, which some 200 delegates attended.